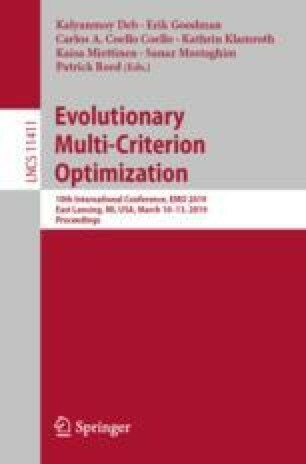 In many practical multi-objective optimization problems, evaluation of objectives and constraints are computationally time-consuming, because they require expensive simulation of complicated models. Researchers often use a comparatively less time-consuming surrogate or metamodel (model of models) to drive the optimization task. Effectiveness of the metamodeling method relies not only on how it manages the search process (to find infill sampling) but also how it deals with associated error uncertainty between metamodels and the true models during an optimization run. In this paper, we propose a metamodel-based multi-objective evolutionary algorithm that adaptively maintains regions of trust in variable space to make a balance between error uncertainty and progress. In contrast to other trust-region methods for single-objective optimization, our method aims to solve multi-objective expensive problems where we incorporate multiple trust regions, corresponding to multiple non-dominated solutions. These regions can grow or shrink in size according to the deviation between metamodel prediction and high-fidelity computed values. We introduce two performance indicators based on hypervolume and achievement scalarization function (ASF) to control the size of the trust regions. The results suggest that our proposed trust-region based methods can effectively solve test and real-world problems using a limited budget of solution evaluations with increased accuracy.